A set of chrome-vanadium metric wrenches, open at one end, box/ring at the other. This type is commonly known as a “combination” wrench. Fixed Wrenches are made of a single piece of metal, and only fit specific sizes of fasteners. Combination wrenches, like the picture above, are chrome double-ended wrenches with an open end and a box end that are the same size bolt on each end. 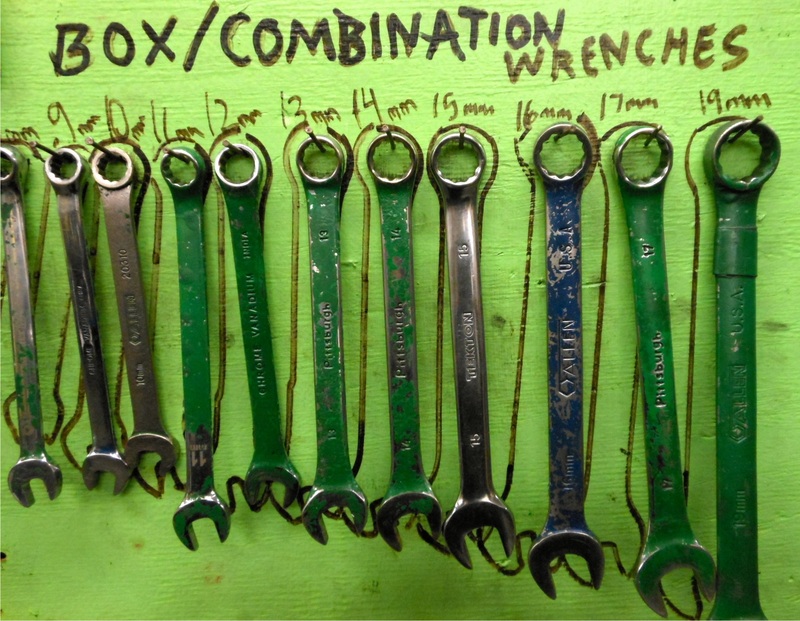 This is the most useful and most common general-purpose wrench style. The box end tends to be stronger that the open end and are the best side to use for high torque uses, because it can contact more than two or three corners of the bolt. They are sized by metric millimeters. Nuts and bolts have a six-sided shape which is usually spoken of as a hexagon. Stripping of the sides will occur if you do not use a tightly fitting wrench. The length of each wrench is related to the amount of force needed to tighten each size nut, so the force needed on your part should be the pull of three fingers. If the amount of effort required to tighten a nut or bolt increases, stop immediately as either you will break something or you are pulling the thread out. Common uses of these wrenches are a size 15 open-end for pedals or a size 15 box-end for axel bolts (instead of a quick release skewer) to remove tires (commonly on fixed gear or mountain bikes). Sizes 8 and 10 are also the most common for various bolts and nuts on the bicycle. This entry was posted in Tool Series and tagged maintainence, repair, tool, wrench on February 6, 2013 by womenskit.